The plastic tank contains a small egg, secured to the base. 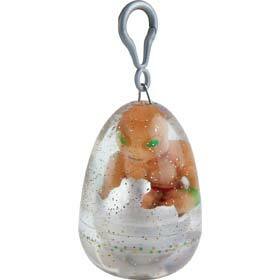 Once the tank is filled with water and left overnight, the egg begins to crack and disintegrate to reveal a tiny alien. Over a couple of days the alien slowly swells in size until it completely fills the tank, whereupon the water can be removed and the tank clipped onto a bag using the keychain attachment.